Jessie L. Nightingale, Jr. is the Founder and Pastor of Guiding Light Ministries, Inc.. He is married to Terri C. Nightingale. They have three lovely children: Jordan, Taylor, and Daniel. Pastor Nightingale received a lot of his training by walking with the Founder of New Life Tabernacle, Pastor Ethel Nightingale Isreal. After many years in ministry, he was ordained as an elder November 17, 2001 by his pastor, Bishop Jasper Rolle, Jr., who is the Presiding Prelate of the Abundant Life Ministries. Pastor Nightingale spent the earlier part of his ministry under the tutelage of Pastor Carrie B. Bryant, who is the Overseer of True Holiness Ministries formally known as Tabernacle of Prayer for All People, Inc. In 1998, he received further refinement and training under the leadership of Bishop and First Lady Horne at Full Gospel Holy Temple in Austin, TX. Pastor Nightingale is currently under the leadership of Overseer Jean Dimmock of Blessed Assurance Ministries located in Savannah, Georgia. Pastor Nightingale's education includes a Bachelor of Science degree in Electrical Engineering from the University of Florida, a Masters of Science degree in Information Systems from the University of Phoenix, and a Masters Degree in Biblical Ministerial Counseling from Truth Bible College and Seminary. He is currently pursuing his Doctorate in Religious Studies from Trinity Bible College and Seminary. Pastor Nightingale is an accomplished musician who has recorded with the Full Gospel Holy Temple choir in Dallas, TX. He wrote two songs on that project entitled "Anointing" and "Lift the Savior Up." The song entitled "Anointing", hit the top 50 charts in Dallas, TX. In 2009, God empowered Pastor Nightingale to produce his first live recording project entitled "God Can." The GLMI album has been a vision of Pastor Jessie L. Nightingale, Jr. for 10 years. He believes that God has ordained this CD to manifest for this appointed time. It is his prayer that these Bible-inspired songs minister to the very core of your spirit. Terri Chane'l Nightingale is the wife of Pastor Nightingale. Lady Nightingale has always been active in ministry. At a young age she knew that God had a call upon her life. She was raised under the tutelage of Pastor Carrie Buie Bryant who is the Overseer of True Holiness Ministries (formerly known as Tabernacle of Prayer for all People, Inc) from 1979 to 1997. In 1997 she and Pastor Nightingale relocated to Austin, TX. During this time, she was mentored by Bishop John W. Horne and First Lady Barbara Horne; not knowing that God was to soon call her into a leadership role where she would need to use the guidance that she obtained during her time in Texas. She also had the honor of recording with the Full Gospel Holy Temple choir in Dallas, TX. After a two years in Austin, Texas, God lead them to Raleigh, North Carolina where she and Pastor Nightingale lived for one year. She believes that this was the season that allowed them to grow together and prepare them for the work that was ahead of them. In 1999, she joined New Life Tabernacle of Praise and Deliverance under the leadership of Pastor Ethel Nightingale Isreal. She experienced a woman of power as Pastor Isreal lead people from all walks of life and encouraged everyone to develop a relationship with God for themselves. In 2000, she and Pastor Nightingale moved once again. This time God was drawing them closer to their divine purpose. Lady Nightingale remembers a prohpetic word by Pastor Isreal that she spoke in 1997 before they moved to Texas that God was taking them out to bring them in. After Pastor Isreal went home to be with the Lord, Lady Nightingale had the privilege of being under the guidance of Bishop Jasper Rolle, Jr. who is the Presiding Prelate of the Abundant Life Ministries and Lady Barbara Rolle. 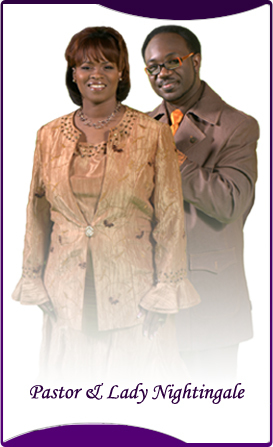 Currently, Pastor and Lady Nightingale are under the leadership of Overseer Jean Dimmock of Blessed Assurance Ministries in Savannah, Georgia. Today, Lady Nightingale is the Treasurer, Administrator and First Lady of Guiding Light Ministries, Inc. This organization was founded by Pastor Nightingale in 2003. She wears many hats in the ministry. She enjoys leading the congregation into praise and worship. It is Lady Nightingale"s sincere desire to become all the God has called her to be and to build up the women of God through faith and integrity.